Simply add the required quantity of tea granules to a teapot or cup, add boiling water, stir and enjoy. Your beneficial tea is ready to enjoy. 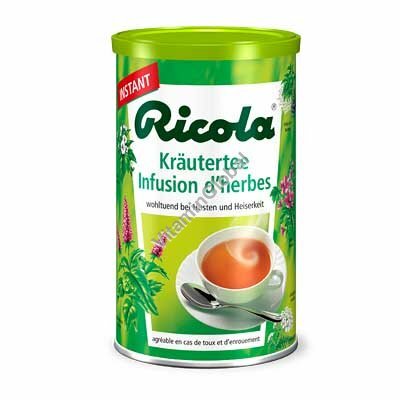 Ricola herb instant teas only contain proven medicinal herbs which are cultivated by Swiss farmers using organic practices and values. The effective ingredients in the herbs and their unique taste are largely preserved thanks to Ricola's gentle production process. Herb, Lemon Balm, Elder Blossom and Good Night tea can be enjoyed whatever your taste and mood! Incidentally.